I have a few questions that hopefully some of you with more experience may be able to help with. First some back story about this case, and it’s lengthy, I apologize. I have a 6 year old sow that was experiencing weight loss in early July and had an occasional sneeze and occasional“knocking” noise in her sinuses. This is not the first URI we have had with her or my other guinea pigs. We had moved out of an apartment that I had overheard had black mold from a contractor through the walls in the unit next door when they decided to make a few spontaneous “renovations.” That was 6 months ago and we had been URI free since the move. Sigh. I started her on doxycycline on July 4th and her weight continued to decrease. This girl usually sits around 1,100 grams and she went down to 860 grams (talk about scary!) within days, but remained extremely bright. A week of antibiotics had improved her eating, but her weight did not bounce back. She became febrile and I started her on metacam. Took her to the vet who ausculted her and said she sounded a bit harsh and also prescribed oral baytril and increased the dose of doxycycline she was receiving. I talked about the possibility of heart problems or cancer and taking some radiographs. He said that his treatment at that time would not change regardless of her rads if he were to take them. Within hours of the first dose of oral baytril she looked like a typical ill pig with puffed fur and squinty eyes, of course. So I discussed this with the doc and we agreed that I would switch subcutaneous injection of baytril once a day and hopefully there would be a slightly lesser instance of GI stasis(I am a large animal technician and was comfortable with this). I also initiated metoclopramide twice and day and simethicone as needed. Her overall clinical appearance improved, but her appetite decreased and she was gassy. I should also say that I had been “transfaunating” her with normal feces from another pig. I also began hand feeding critical care about 20-25 grams of mixed product every 3 hours around the clock. She still drank a lot of water and she continued to eat hay and vegetables, but not nearly enough to sustain her. Her poop became loose. This went on for 10 days and she decreased to 840 grams. Vet saw her and said she sounded better. We discontinued the baytril, but all other treatments remained the same and he added subcutaneous fluids at 20cc once a day because her skin turgor was slightly decreased and her drinking had decreased. He wanted to continue the doxy for at least another week (mean while two of my other pigs started to lose weight too and sneeze and were thusly started on doxycycline and everyone is separated). The first three days following the lack of baytril, she was eating better and I even decreased the critical care and she gained weight. However, on Monday her weight decreased again and she developed diarrhea. My vet was out of town for this week. I backed off the fluids, because I was concerned that I was flooding her. Her diarrhea continued. I went back to pushing the critical care hard. One good thing is that she’s remained afebrile for 5 days. Once again she lost weight one day only to have it increase again the next (this is with weighing the same time everyday). I discontinued the subQ fluids and started being aggressive about oral pedialyte. I have also been supplementing her Vit C orally at about 50mg/day. I had thought about the possibility of biosponge (being large animal we have pounds of it), but of course I don’t want any complications if she’s still experiencing ileus. I don’t need an impaction on top of everything. Today she weighed in at 805 grams which is up from yesterday’s 795 grams. Tomorrow should be her last day of doxy. 1.) What is the longest period of time you have ever hand fed a guinea pig and what was the outcome? 2.) Have you ever had a pig with heart disease develop a fever that wasn’t secondary to respiratory illness? 3.) Have guinea pigs that you’ve seen with heart disease experience a steady decrease in weight or a fluctuation? 4.) This referral hospital has a big reputation for pushing certain procedures that make more money, but may not be in the best interest of the animal. I am thinking that they may try to push bloodwork, but I am concerned about: A.) stressing her and B.) if she’s stable enough to be anesthetized at this time and if it would change anything anyway. I know that knowing her BUN would be helpful if we start an ACE inhibitor, but at this point I feel a trial would be the way to go anyway, because what do we have to lose? Any thoughts? Would you go for bloodwork? The vegetables I have offered on a daily basis are lettuces, carrot, fresh grass, tomato, a little cucumber rind and a little Italian parsley. She doesn’t eat it all so she can’t be OD’ing on any one thing. She also has free choice timothy hay. I have read all the Guinea Lynx pages on antibiotics, probiotics, diarrhea and heart disease. If you’ve read this far, you are a saint. An outstandingly patient human being and thank you for your time! I greatly appreciate it. I know I am only a drop in the bucket of guinea pig health sagas. Briefly, but I'll write more later when I have time. 1) One of our members, daisy mae, hand-fed a pig for five years. You can probably search up her thread. 2) No experience with that. 3) Loss of weight is more usual than fluctuation. And it's VERY hard to get a senior pig to gain weight. The more typical pattern is lose a little, plateua, lose a little more, plateau again, rinse and repeat. 4) At her age, I definitely wouldn't do bloodwork that required venipuncture. If they could get what they needed by overtrimming a nail and getting a smear of blood, that's all I'd go for. Good luck with her, and keep us posted. 5 years, wow! I guess a more appropriate question would have been how long has someone successfully hand fed a pig that was recovering from an illness where inappetence was a symptom. I read in Daisy's case that her pig had malocclusion and I assume(?) wanted to eat, but was otherwise physically unable. Also, does anyone have an suggestions on an ointment for her diarrhea booty? I have been bathing her bum, but I was thinking of clipping the hair back there and applying ointment to keep cleaner, but I don't know if anything over the counter is safe. I did order some ointment from gorgeous guineas last week, but I know it will take a little time to get here to the states. Clipping the hair will definitely help. And you can use Desitin on the area. It's usually used for urine scald, but it should protect the skin. As far as feeding a guinea pig that's not hungry, I know a few people have done it for a couple of weeks, but I can't think of anyone in particular who might be able to help you with that. Ditto on the Desitin (a diaper ointment). Have the teeth been examined? Sometimes with illness, a guinea pig can develop malocclusion (a secondary illness). Great. Yeah we use zinc oxide for the foals too. I just wasn't sure if it was safe for the pigs since foals can't touch their butts or drag their bums on the ground. The vet did examine her teeth upon her initial exam. And when she does eat vegetables and hay she does so with ease. However, I will make sure that the vet takes another look tomorrow, won't hurt to have a second look. Thanks for the suggestions. Just apply the zinc oxide sparingly and you should be okay. This morning before her weigh-in I saw her drinking from her water bottle which I haven't seen in days. When I picked her up she felt "beefier" and I was very hopeful. However, the scale showed that she's down to 790 grams. You know it's sad when you are having dreams, let me correct that-fantasies, about normal feces. I had a dream two nights ago where a bunch of normal feces just flew out of her behind and I actually cried tears of joy so enthusiastically that I woke myself up! Haha! We still have diarrhea. She's still bright and actually trying to convince me that she doesn't need hand fed right now, to no avail. We will see what the day brings. Probably a silly question, but you did discontinue all veggies, right? The Critical Care alone will sustain her nutritionally. Her physical today was WNL. I told them I wanted rads done and we did a series. Her heart was very enlarged with pericardial effusion. Also, she was very distended with gas, which we knew, and had a suspect full or partial torsion of the cecum. She was already anesthetized so I OK'd the blood work because I figured if she had a torsion, and thusly dead bowel, surely her WBC count would be in the toilet. 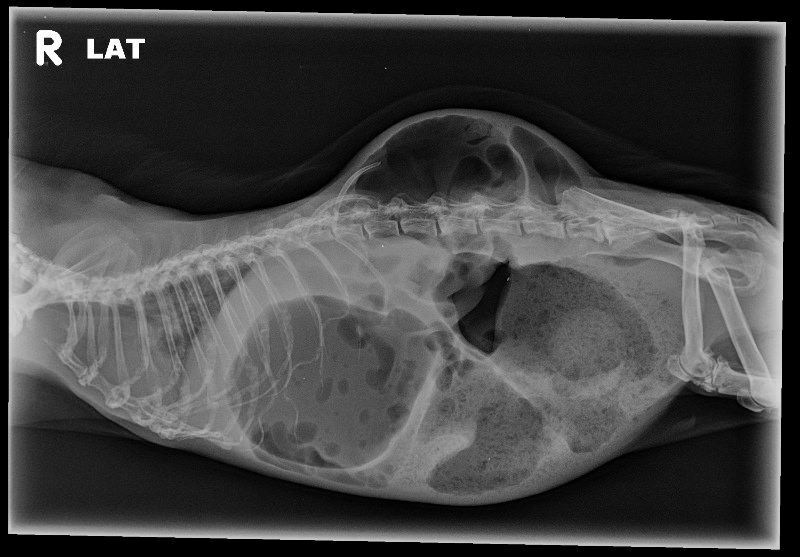 She showed me the rads and we also noted a probable gastric impaction because her stomach was gigantic. Her CBC/Chemistry was unremarkable. The vet recommended ultrasound, hospitalization with fluids and radiographs again in 8-12 hrs to see if her GI tract abnormalities would resolve. And if they did not then abdominal surgery to correct the lesion would be the only option, which I knew. This is where I decided to end it. Yes we could try to treat it medically, but the fact is if she has a torsion, which it appeared she did, that is a painful process that I see in horses almost daily that I do not wish upon her. She is 6 and she also has heart disease. What still astounds me is that she did not appear "sicker." The vet said, " Well you know a horse will continue to eat even with a perforated bowel." I said a horse with a perforated bowel would be rolling in his stall, sweating profusely with an extremely elevated heart rate. It's insane. If she only had the enlarged heart, I would've pursued treatment. However, with all the other complications, it just wasn't fair to her in my eyes. Of course it makes me feel like a jerk because she didn't want fed this morning, but she ate it from me anyway. Even with a potential gastric impaction. But hell she was eating hay on the way to vet and while we were at the vet. How is that possible? And to answer your question she was not eating veggies when her diarrhea was bad or when she was very gassy. Anyway the vet will be doing a necropsy tonight to confirm or disprove her diagnosis. Also the radiographs will be sent to me here at some point. I can post them if you guys are interested once I receive them. They are pretty gnarly. I'm so very sorry. I had that happen to one of my pigs this past spring, and it's a gut-wrenching thing to do to let them go. Do please post the x-rays. We're always glad to have them. I am so sorry, Clint The Cuy. You seem so knowledgeable and tried to figure out what was going on. I wish her prognosis had been better. I'm so sorry for your loss. 6 is a good mature age for a pig, so you know you did everything right. Your decision was the kindest you could make. Thank you everyone for the kind words. She was a sweetheart and it's always harder to let them go when they are a kind and gentle soul. The necropsy revealed that indeed she had heart disease, what appeared to be some chronic changes in her lung tissue, but no torsion. Her stomach was distended with gas, not food. However, she did have a mass on her liver and a mass on one of her ovaries. I am glad I had her do the necropsy. It is so hard when there is not enough literature on cases like these to refer to and most of the information comes from a post-mortem exam. It may help another pig, it may not. I still have no radiographs to post. Thanks again everyone. Necropsies can indeed help understand what happened. I think it was worthwhile for you. Radiographs were sent today, but the radiologist's report has still not been sent. I actually have not seen the official report from the radiologist. I only heard the interpretation of the vet at the referral hospital. Figured I'd post them anyway for educational purposes since they are abnormal. By the way, her cecum is so filled with gas it appears to extend above her back because she is so distended and on her side (lateral view). 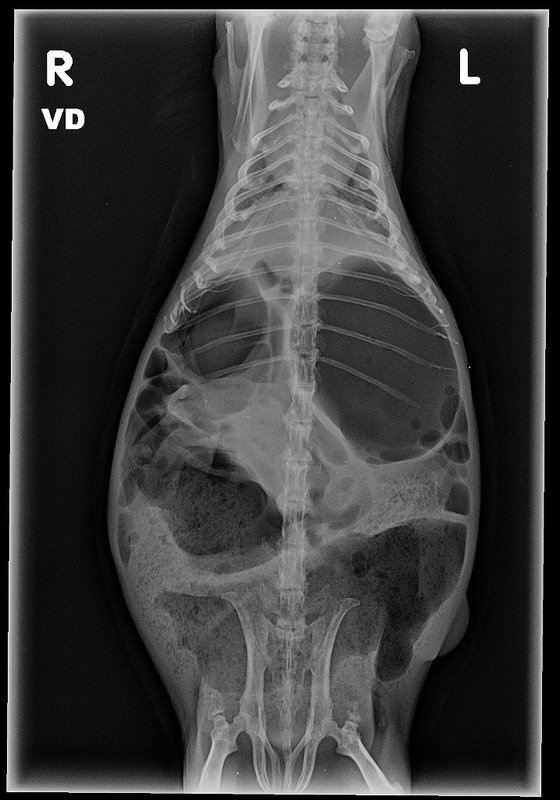 This is what the vet at the hospital interpreted as a possible torsion that ended up not being a torsion. When she was in sternal recumbency, she did not have any gas distention extending above her topline (back), if that makes sense. That bulge does look dramatic. You can see from the location of the spine that she was not completely on her side. Let me know if you'd like your pictures added permanently to your thread for future readers. You are right, her pelvis and hips are actually obliqued, not lateral and those crazy looking last ribs too. Please do add them to the thread. I appreciate it! *The suspect cutaneous mass that he mentions, was in fact cutaneous and was noted as a sebaceous cyst by a vet 3 months prior to this. previous courses of abx for sneezing and not eating. spine.Stifle DJD as noted on the lateral view. normal. No abnormalities of the extrathoracic skeletal structures are identified. 1) Marked gas distention of the stomach and cecum with some intestinal distention. Ileus is suspected. secondary to heart failure, particularly if a murmur is present. 4) Degenerative changes of the spine and stifles with bilateral gluteal mineralization. 5) Cutaneous nodule probably mimicking a caudal abdominal mass on the lateral view. 2) Antibiotic therapy may be indicated, particularly if white blood count is elevated. 3) Aggressive therapy for presumed ileus. impression of an abdominal mass on the lateral view is artifact.